One pair of tires. Sized for the standard factory .250 OD Tyco 440x2 rear rims. If mounted on Viper .265 single flanged hubs, net size is approximately .464 OD. Pro-8 Traction Magnets for a great handling car with paired with these tires. They can be used on other rim configurations. Finished axle set and car are not included - for example only. One pair of tires. Sized for the standard factory .250 OD Tyco 440x2 rear rims. Pro-8 Pro-10 Traction Magnets for a great handling car with paired with these tires. One pair of tires. Sized for standard Tyco 440 rear rims that are .250 OD. HC Slots helped in the development and testing of these Tyco specific Super Tires. The goal was to offer tires that work specifically with Tyco 440x2 and HPx2 chassis running stronger motor and traction magnets. "B" Firm tires are recommended for cars running 2.8 ohm armatures and Pro-8 Motor and Pro-10 Traction Magnets. They can be used on other rim and car configurations but might have to be trimmed. Color will be dark gray to black. Urethane tires are recommended for cars running stock ceramic or Pro-4 Motor Magnets and Pro-8 Traction Magnets. 3 Pairs of shoes. New run of reproduection shoes. Five each steel pins. Specifically for Tyco cars. Light weight design. Five each steel pins. Specifically for Tyco cars. All new parts. Silver Plated Pickup Shoes, Pickup Shoe Springs, and Motor Brush Springs .Wizzard 80% Copper Motor Brushes. Three each Nylatron 25T Crown Gears. Mate with Tyco pinion gears as well as Viper, Tomy, and BSRT pinion gears. Gears can be utilized on other brands of HO slot cars when properly fitted. Nylatron gears are not recommended for cars running Level 10 and higher magnets. 3 Pairs of shoes. Equal to or better than original factory parts. Built car for example only - not included. TEN pairs of magnets. North / South oriented so they can be installed in either high downforce or low downforce (motor mode). These are 'drop-in' for any Tyco 440x2 chassis or Mattel HPx2. Note: ceramic magnets are not as strong as level 4 compression molded magnets. These are good 'all ceramic' magnet classes. Also they work well when running proper sized silicone sponge rear tires. One pair of magnets. These magnets replace standard factory Tyco 440x2 traction magnets. They are North/South oriented so they can be installed in either Hi or Low downforce. Magnets are marked "L" and "R" for Hi-Downforce installation. Magnet holders are NOS factory parts used in the famous Japanese Tyco 440x2 "Super Circuit" cars. Those original parts used cobalt magnets inserts. We've upped the game and fitted the holders with Level 42 neo magnets. These magnets have more applied downforce than our level 10 polymer magnets. Recommended armatures would be the AMG 3.5 ohm or 2.8 ohm for Tyco/Wizzard. Standard factory ceramic motor magnets work, but Pro-4 with a 3.5 or Pro-10 with a 2.8 may be better. Light weight design means superior handling performance in corners. You carry less mass than traditional ceramic or polymer magnet designs. Magnet holders are slightly wider on one side. Install that side facing out of the chassis. Use a firm rear tire like Super Tires "B" or Super Tires Urethane for Tyco. Limited availability for these NOS holders. These magnets will NOT work with Mattel HPx2 rear bulkheads. One pair of magnets. North / South oriented so they can be installed in either high downforce or low downforce (motor mode). These are 'drop-in' for any Tyco 440x2 chassis or Mattel HPx2. Magnets are marked red for the right side and white for the left side. Installing them like this will be low downforce. These compression molded magnets are engineered for better fit and performance. These magnets bring out the best in most factory stock cars. One pair of magnets. These are the real deal Level 4 compression molded motor magnets. Designed for a 'drop-in' fit for Tyco 440 and Mattel HPx2 cars. Magnets have a 'hang down' flush fit design to allow better handling due to increased magnetism to the rails. Use with lower ohm armatures and Pro-8™ or Pro-10™ traction magnets for best setup. One pair of magnets. Level 8 grade compression molded magnets are 'Drop In Fit' for Tyco 440 based cars. You get better performance in two ways: the magnets are very consistent and do not need to be gauss meter matched. Secondly the magnets are flush with the bottom of the chassis to allow more magnetic attraction to the rails. This helps keep the front end planted for better handling. Typical use with these motor magnets are in any class of car formula that calls for polymer magnets - generally factory based 3.5 ohm and lower armatures. Ready to run car for example only. Note: Cars built with Pro-8 Motor magnets and Pro-8 & Pro-10 Traction magnets will need to use the Tyco black stiff chassis. The gray nylon chassis will be too flexible. You will need to use better quality rear axle sets with pro quality gears from Viper, BSRT, Wizzard, or Slottech. The Tyco factory gears will be too soft and fail quickly. One pair of magnets. North / South oriented so they can be installed in either high downforce or low downforce (motor mode). These are 'drop-in' for any Tyco 440x2 chassis or Mattel HPx2. Magnets are marked red for the right side and white for the left side. Installing them like this will be low downforce. These compression molded magnets are engineered for better fit and performance. 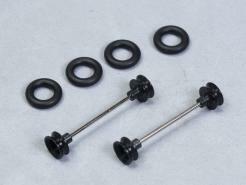 You get one (1) complete axle set: Hubs, O-Rings, Axle. Get your ride slammed for best handling!! These are the real-deal CNC machined Delrin front 'o-ring' hubs and axle sets. These are designed to run in Tyco 440x2 & Mattel HPx2 Wide-Pan cars. Other applications can be done with different size o-rings installed. O-rings finish at .405 OD. For reference, factory Tyco / Mattel wide-pan fronts are .434 OD.